Christmas Teddy Bears - 15"
Loved the bear it is more than I ever expected. Dressed all warm in their red and white striped scarves, these lovable teddy bears are ready to celebrate this Christmas with you and the family. These two bears are named Mocha and Latte. Mocha is the brown bear and Latte is the cream colored teddy bear. Both measure 15" tall and are from our popular Aurora Plush Collection. 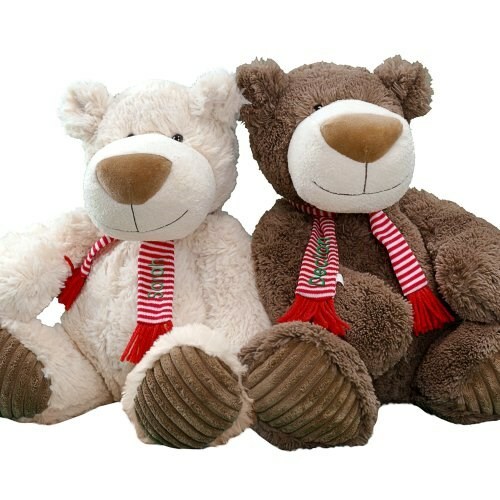 Both feature a modernistic, oversize nose and have enjoyably soft brown exterior and corduroy pads on their plush feet. Free personalization of any name is embroidered on the scarf. Free gift wrapping and a free gift message are included to create a thoughtful presentation. VERY NICE BEARS AND THEY COME WRAPPED SO NICE. I sent this bear to my three daughters and they all loved it. Additional Details Ring in the holiday season with a Christmas teddy bear from 800Bear!